Top Secret! – Parody of WWII spy movies in which an American rock and roll singer becomes involved in a Resistance plot to rescue a scientist imprisoned in East Germany. Milk Stout from Left Handed Brewing Co.
We did something totally different this week in order to stay on schedule, It may have been a mistake, you tell us. We ended up watching the movie together while playing pool and drinking beer, just before we recorded the show. We thought it would make the review more fresh, but this was a very hard movie to review, regardless of how much you pay attention, so in actuality, this may be the only movie ever made that we could pull off with this sort of setup. It’s a movie we’ve both seen, but not too recently, and it’s also another one that was in JB’s collection. 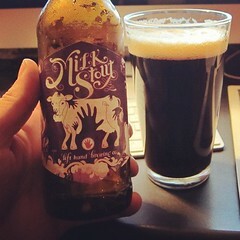 This episode was sponsored by That Bead Girl and she picked the movie and supplied the beer, which was a deliciously creamy Milk Stout from Left Handed Brewing Co, that was of course inspired by the cows in the movie. That Bead Girl is also a proud sponsor of Dawn-a-pa-Drew-za 5.0. « Freaks	» Return of the Killer Tomatoes!